A blend of divine inspirational messages with magical celestial music… Works while you are asleep or awake on the soul level transforming your consciousness. This CD is something different, wonderful and original. The music by Gerald Jay Markoe radiates love, peace, and harmony. It features classical orchestral elements, angelic voices, monks choir and celestial background textures. Divine inspirational messages channeled through Phoenix, who is a pioneer in the field of coaching people in both business and spiritual matters. 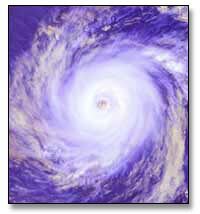 Phoenix is also a spirit guide, intuitive advisor and the author of the acclaimed book Messages from God. This divine combination raises both your spiritual and material consciousness while harmonizing your whole being. Perfect for creating a divine spiritual connection and for enhancing Yoga, relaxation, meditation, healing, massage, Reiki, Chi Kung, work, sleep and more. Specialty Music at COVR Awards at INATS West ! 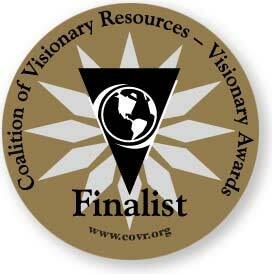 For the tenth consecutive year, COVR Visionary Awards were presented at the International New Age Trade Show INATS West dinner banquet on June 23rd, 2007 in Denver, Colorado. This prestigious award is important in that it is judged by retailers and seasoned professionals who evaluate each title based on content, presentation, and their own knowledge of the industry. Phoenix and Gerald Jay Markoe are extremely pleased and honored to receive this distinction and award. Messages From God stems from spiritual coach Phoenix's 15 years of experience helping peole transform their lives and experience peace, joy and happiness. "I am here to help people be all they are meant to be," Phoenix says. The Messages From God CD is an offshoot of the origianl book, which is a series of messages Phoenic channeled over five years while coaching her business clients. This CD, from gifted intuitive and business and spiritual coach Phoenix, with music composed by Gerald Jay Markoe, plays like a gentle crash course in self-empowerment and affirmation. Combining spoken word and arrangements of classic orchestral instruments and celestial synthesizer sounds, the disc is perfect for meditation, yoga and relaxation... Read review. This one of a kind CD blends 365 Universal truths for peace and prosperity with magical celestial music that is simply transformational. This divine combination raises both your spiritual and material consciousness while harmonizing your whole beings. The music of Gerald Jay Markoe (“The Mozart of the new age” – New Age Voice magazine) radiates love, peace and harmony. It features classical orchestral instruments, angelic voices, monks choir and celestial background textures. 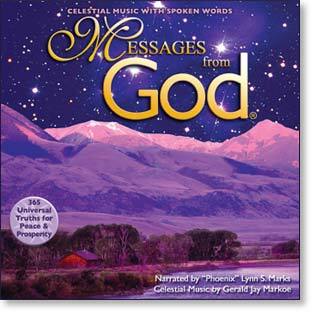 Divine inspirational messages are narrated by Phoenix, an intuitive spirit advisor and author of the acclaimed book Messages from God ®. Perfect for Yoga, meditation, healing, massage and relaxation. Recently Debra Hires, the editor of Evolve, invited Phoenix to write this article on the creation of the Messages from God CD. Here's the full article for your reading pleasure. 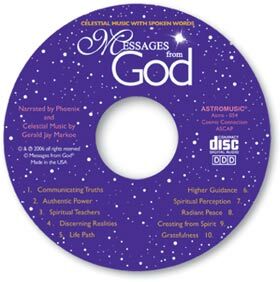 "The Messages from God CD is medicine for the soul and mind. It takes away anxiety and fear. It allows you to see your greatness and the good in life. You can't listen to it once. It's a CD that you always want to carry with you in your car or have in your home and office as you embrace daily challenges and continue to materialize your full potential." “We play the "Baby Einstein" CD's to our newborn baby supposedly to help him develop his brain...well now there is a CD that I know is developing our child's spirit and soul, Messages from God. I can go as far as to say that it can even prevent post-partum blues. I'm a living testimony. * Please let us know if “Messages from God” is available at your store and we'll add your contact info to this page. Email info@messagesfromgod.com .